Humanities Foundation proudly supports Pinwheels for Great Childhoods as a partner with the Daniel Island Exchange Club. 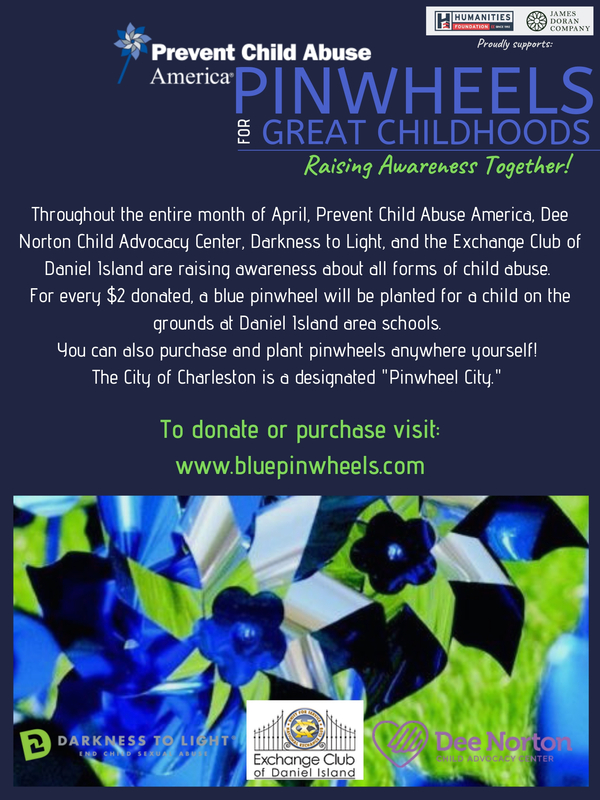 April is Child Abuse Prevention Month and to raise awareness the Daniel Island Exchange Club, Dee Norton Child Advocacy Center, Darkness to Light and Prevent Child Abuse America will be participating in the Pinwheels for Great Childhoods campaign. The Daniel Island Exchange Club and community partners will be selling blue pinwheels throughout the month to raise awareness, provide better education of the issue and the importance of prevention. The pinwheel is a national symbol representing that all children deserve safe and happy childhoods. To donate, purchase pinwheels or learn more about the campaign go to www.bluepinwheels.com. Pinwheels purchased online can be picked up Monday through Friday at First Citizens Bank on Seven Farms Drive from 9 a.m. to 5 p.m.